Essential Oils are the life blood of a plant. They are mentioned more than 200 times in the Bible, most commonly for anointing or healing. They are similar in composition to the human body and are easily absorbed by the body. If you inhale an essential oil, it will reach the brain within 22 minutes. If you apply it topically, it can be detected in the bloodstream within 2 minutes, and within 20 minutes it will have affected every cell in the body. Essential oils do not treat, cure, or prevent any illness. Rather they help the body to function as God designed it to. They are truly pure, therapeutic grade essential oils. They are steam distilled, usually right in the country where the plants are grown. They are tested by Young Living and also a third party testing facility to ensure purity and the maximum number of beneficial properties. In the US, to be labeled a 100% pure, essential oil, the bottle only needs to contain 1 drop of pure, essential oil. The rest can be fillers or impurities. You do not want impurities in your essential oils because many essential oils contain properties that allow them to pass through the blood-brain barrier, and you do not want them to carry toxins to your brain. 1. Aromatically. You can diffuse the oil with a diffuser (the Basic Plus Starter Kit and Premium Starter Kit both come with a Home Diffuser, and there are several others that you can purchase), inhale it from the bottle, or place a drop on your hand and cup your hands over your face. 2. Topically. Apply as directed on the bottle. Essential oils are often applied to the bottom of the feet or the area of need. When applying essential oils on young children or sensitive skin, you will want to dilute the oils with a carrier oil (coconut oil is our favorite!). For the young children, I will often put 1-2 drops of essential oil in 1 Tablespoon of carrier oil. Essential oils can also be mixed with Epsom Salts and added to a bath. 3. Internally. Some oils are recognized as Generally Regarded as Safe (GRAS) for consumption. The citrus oils are among those oils. When consuming oils, never put them in a plastic cup. Always use glass. I recommend starting with the Everyday Essentials Kit (which is also included in the Premium Starter Kit). It contains 10 of the most popular Young Living essential oils and gives you a fantastic start to your family’s natural health toolkit. LAVENDER: I find myself using the oil almost every day! It is “first aid in a bottle”. It contains antihistamine, antidepressant, antiseptic, anti-inflammatory, antifungal, anti-infectious, and sedative properties. Lavender is my first choice for cuts, scrapes, burns, and other boo boos. It is very soothing to the skin, and a wonderful choice for eczema, rashes, and cradle cap. You can dilute it with coconut oil and massage it around your eyes for any kind of eye trouble. It is also my first choice for allergies (just place one drop under the tongue or place a drop on your thumb and put your thumb to the roof of your mouth). LEMON: Lemon is an antiseptic, antifungal, antiviral, antioxidant tonic. I start out each morning by consuming one drop in a glass of water (make sure you use a glass cup) with some Apple Cider Vinegar, which can help with gout, kidney stones, gallstones, and digestive problems. It helps to balance the pH and supports the immune system by making white blood cells. Lemon is also an astringent. It works extremely well in removing stains, gum, and grease. I add it to the steam cleaner to help disinfect, clean, and purify. Lemon is invigorating and a can help with poor concentration. We often diffuse lemon during school time. PEPPERMINT: Peppermint is an analgestic, antiseptic, and anti-inflammatory, making it wonderful for aches and pains (including headaches). It is also good for tummy aches. For centuries peppermint has been used to soothe digestive troubles such as colic, constipation, heartburn, indigestion, and nausea. It can be used to help reduce fever and aid respiratory function (useful for asthma and bronchitis). FRANKINCENSE: Frankincense is known as a cure-all. It is mentioned in the bible at least 52 times, most notably known as one of the gifts the wise men gave to Jesus. It is anticancer, anti-infectious, anti-inflammatory, antiseptic, antitumoral, and an immune-stimulant. It contains sesquiterpenes, which enables it to pass through the blood-brain barrier. It also increases the activity of leukocytes, so it can be effective in fighting infections. One drop on the big toe has been said to stop seizures. It a good choice for allergies and supporting the respiratory system (coughs, asthma). Apply topically to remove growths from skin (i.e. warts, moles). Frankincense is also clarifying and can be diffused during prayer and meditation. It is approved by the FDA for use as a food additive and flavoring agent, however consumption for children less than 6 years old is not recommended. Mix Frankincense and Copaiba for a powerful anti-inflammatory. PANAWAY: Wonderful for pain, arthritis, and injuries (sprains, strains, bumps, bruises). PanAway is a blend made up of Wintergreen, Helichrysum, Clove, and Peppermint. Wintergreen contains 99% methyl Salicylate, which gives it properties similar to aspirin or cortisone. Helichrysum is a powerful anti-inflammatory and improves circulatory function. Clove is a topical anesthetic and anti-inflammatory. Mix PanAway with coconut oil and apply on location. PURIFICATION: The oils (Citronella, Lemongrass, Rosemary Cineol, Malaleuca, Lavandin, and Myrtle) contained in this blend have powerful antiseptic, antibacterial, and sanitizing properties. Lemongrass is known to kill even MRSA. This blend purifies the air, repels bugs and pests, and neutralizes poison from insect and spider bites. Place a drop on a cotton ball and place it in the air vent in the car to freshen the car. THIEVES: This blend of Clove, Lemon, Cinnamon Bark, Eucalyptus radiate, and Rosemary cineol is a powerful antiviral and antiseptic. It got its name because it was used by the thieves in England to protect them from the plague when they were stealing from the dead. A study conducted by Weber State University in 1997 showed a 90% reduction in the number of Gram-positive Micrococcus luteus organisms after diffusing Thieves for just 12 minutes, and a 99.3% reduction after 20 minutes. It is also effective against mold and can penetrate into the sheetrock and insulation in a house (diffuse for 24 hours if dealing with a mold problem). Apply to the bottoms of the feet or massage under the arms at the first onset of flu, colds, strep, bronchitis, etc. Young Living also makes several Thieves products, including hand sanitizer, hand soap, wipes, and spray. These are great alternatives to the commercial hand sanitizers and cleaners that are loaded with harmful chemicals. I like to keep the wipes in the diaper bag to wipe down shopping cards, tables and high chairs, and hands. VALOR: Known as “Chiropractor in the Bottle”, Valor contains Spruce, Rosewood, Blue Tansy, and Frankincense. It balances and aligns electrical energies within the body. It is a great choice for scoliosis and spinal pain. You can also use this blend to empower the physical and spiritual body. It is calming for hyperactivity and ADD in children. Best applied on the bottom of the feet (up to 6 drops), but also on pulse points. To balance the left and right brain, put valor on the right rights and rub the left temples, or do the reverse. It is also an oil used in the Raindrop Technique where it is applied along the spine. JOY: A powerful blend comprised of Bergamot, Ylang Ylang, Geranium, Rosewood, Lemon, Mandarin, Jasmine, Roman Chamomile, Palmarosa, and Rose. It promotes feelings of love and being held, something every child needs! Rub over heart, ears, temples, and wrists. You can wear it as a perfume or cologne. It is also an excellent choice for the bathwater. Dilute with V-6 oil to make a massage oil. Add a few drops to a wet cloth and place in the dryer for great smelling clothes that lift the Spirit all day long. *Oil Testimonials is my favorite internet resource. You can search nearly 8,000 testimonials by keyword. Enter a symptom to find out which essential oils have worked for others. Or, enter an oil to find out new and alternative uses for that oil. 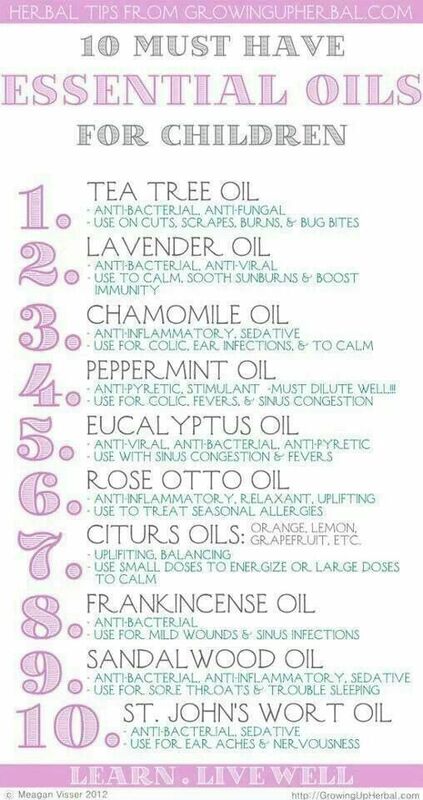 Remember, essential oils are highly versatile, so one oil can be used for many different ailments. You do have to register with a valid email address, but it is free to use. *Search Facebook Page “Baker’s Guide to Essential Oils”. Stop by to say hello, learn more, ask questions, and share your story. To see the full line of Young Living Products and to get started using essential oils visit https://www.youngliving.org/JBaker509. Order as a Young Living Retail Customer, or sign up to be an Independent Distributor (you need to purchase one of their kits) to receive a 24% discount on product purchases and receive bonuses and commission. The Premium Starter Kit contains the Everyday Oils Collection highlighted in this article, as well as Stress Away (a mom’s lifesaver! ), a home diffuser, Essential Oils at a Glance user’s guide, and several sample packets. If you order the Premium Starter kit under my team (Please use Member ID 1570232 and Enroller ID 1572032), and send me an email letting me know 3 of 21 referred you (samandjessbaker@yahoo.com) I will donate one bottle of Lavender (per kit) to Precious Baby Ministries to include in their newborn gift baskets. Thank you! Robin and I have been using essential oils for a while now and we currently use them every day. Below is just a small example of their many uses. Below is information regarding two classes that Jessica will be hosting. Please contact samandjessbaker@yahoo.com or tsambeau@yahoo.com for directions if you are interested. 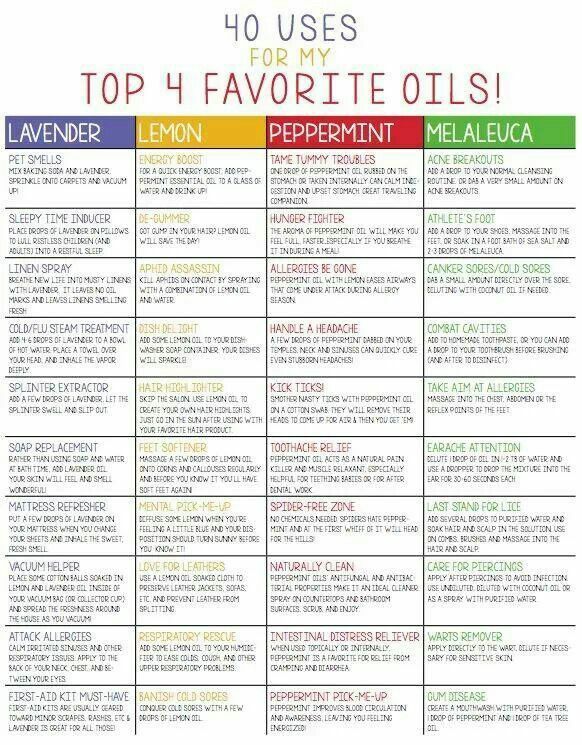 Learn about and how to use the Everyday Oils. Rhonda Favano, a Doctor of Naturopathy and Certified Natural Health Practitioner, will be presenting a class on the Practical Applications of Essential Oils in Siloam Springs, AR, we will be fortunate enough to Skype in and learn some valuable wisdom. If you are interested in learning where, when, why, and how to apply essential oils, please join me at my house shortly after 6pm. The class will start at 6:30, so this will give us some time to introduce ourselves and get settled. I will have some essential oils to sample and apply. You can message me for more information or if you have any questions. Have a blessed day everyone! Learn how to enhance your homeschool classroom with the Everyday Oils Collection. *These suggestions are intended for the YLEO's only and are not intended to diagnose, treat, cure, or prevent any disease.